The MIT Innovation Initiative oversees the interdisciplinary Entrepreneurship & Innovation Minor. The Entrepreneurship & Innovation (E&I) Minor educates students to serve as leaders in the innovation economy with the knowledge, skills, and confidence to develop, scale and deliver breakthrough solutions to real-world problems. They will be prepared to do so within a range of organizational contexts: an entrepreneurial startup of their own, as key members of a founding team, or as an entrepreneurial member of a large organization. Jointly offered by the School of Engineering and Sloan School of Management, the minor is designed as an interdisciplinary program with a coherent combination of conceptual and practical elements that draws on a wealth of prior educational activities in this domain. The innovation process from the conception of an initial invention and the problem it may solve, to the refinement of the solution, to the considerations needed in the scale-up and delivery of the solution, to the launch of an appropriately funded entity. The personal skills of communication, teamwork, decision-making and leadership, and the integrity and character, that are necessary to engage with stakeholders and develop the invention into a real-world product or process. Strategies and methods to engage in rigorous iterations to identify and deeply understand societal needs/problems and develop robust scalable solutions. A range of global contexts for entrepreneurship and innovation, including variations in the interface with key stakeholders whose interests have the potential to enable or limit the potential effectiveness of innovation and entrepreneurship. Requirements for the minor are structured around five courses. Students will complete a core curriculum consisting of two E&I Foundations subjects. In addition, students will complete an elective subject in each of the three domains – E&I in Context, Leadership of Teams & Organizations, and E&I Experiential. These subjects will introduce students to foundational knowledge and skills for systematic entrepreneurial & innovative action. The knowledge developed in the two core courses will enable the further skills development and practice experiences to follow. This requirement will develop students’ ability to understand the role of entrepreneurship and innovation within various contexts, including its role in promoting economic growth and prosperity, interactions with policy, as well as consideration of impacts on environmental resources. This requirement will develop capabilities to lead effectively in entrepreneurial situations. This entails forming and leading teams (in both large and small organizations) to move ideas to impact under conditions of uncertainty, which includes understanding how to balance multiple perspectives and seek out the expertise of others. This requirement will enable students to complete a hands-on project in which they apply the skills they have developed across all three learning goal categories. With foundational knowledge in E&I, understanding of the broader context, and leadership skills to form and drive teams, students will be prepared to maximize the impact of their projects: both economically as well as socially in the value delivered to end users and society. EC.7## One 9- or 12-unit D-Lab subject meeting the criteria for this category may be counted towards the E&I Experiential requirement (selection must be approved by Minor Advisor). * Subject has prerequisites that are outside of the program and may limit enrollment to majors in the relevant Course. 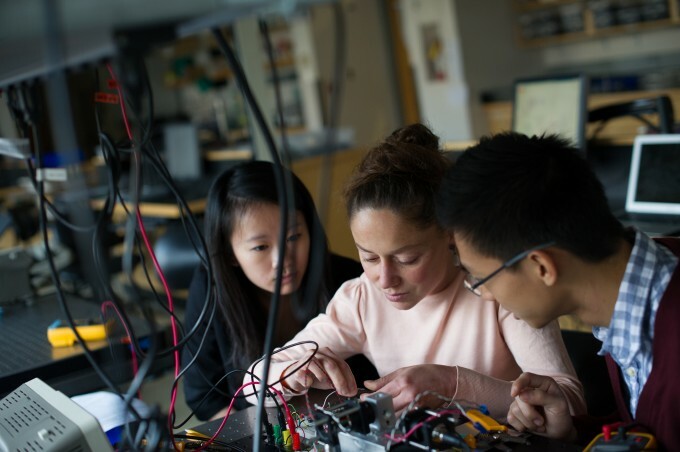 The Entrepreneurship & Innovation Minor is available to all MIT undergraduates. Students may not overlap more than two of the five minor subjects with any other major or minor. Students may not minor and major in the same field, thus students majoring in Management in the Entrepreneurship track are not eligible for this minor. The subjects taken for this minor must be taken for letter grades (or must have been taken the first semester of Freshman year). Minors are awarded when the S.B. degree is awarded, and must be associated with a specific degree. Students enrolled simultaneously in an undergraduate and graduate program must complete their minor(s) with the undergraduate degree. Students may download the E&I Minor Application Form and either print it or fill it out electronically. This form must be approved and signed by one of the minor advisors and then sent to the Academic Program Manager, Liz Friedman in E70-1234. Students should structure classes around a coherent theme and will need to meet with a minor advisor to assess goals and select the best classes for those objectives. We advise students to submit minor application forms by the end of their junior year. All changes must be approved by a minor advisor. If a student decides not to complete the minor, s/he needs to send an email to Liz Friedman, lizf@mit.edu, with his/her full name, MIT ID number, and class year. Once all minor subjects are completed (or once a student is in his/her final semester at MIT), s/he should fill out an E&I Minor Completion Form. This form must be approved and signed by one of the minor advisors and then sent to the Academic Program Manager, Liz Friedman in E70-1234. An unofficial transcript (or a grade report pulled up on a laptop). Printed copies of unofficial transcripts are available free of charge from the Student Services Center, 11-120. A copy of the current registration (only for seniors in their final terms). Once a passing grade has been reported for a last term subject, the Registrar’s Office will record the minor as complete. If a student is graduating and currently taking one or more minor subjects in his/her final semester before graduation, s/he may list the subjects on the completion form and they will be audited once grades are submitted at the end of the semester. Please note: the student must list any last term subjects under the exact subject number that appears on their registration. For jointly listed classes, this is crucial, as the system will audit only the listed subject number. Students must file a minor completion form by the end of the third week of their final term at MIT, even if they are taking some of their minor subjects during that term. Students may file the completion form at any point after they have completed the subjects in the minor—there is no need to wait until their final semester—but they must do so by the deadline above in order to avoid a $50 late fee. For more information please contact the Innovation Initiative Academic Program Manager, Liz Friedman. For additional courses beyond the minor requirements that might be of interest, please click here.